Preheat oven to 350 degrees Fahrenheit. Generously a soufflé dish and set aside. Cut the kernels from the ears of corn with a sharp knife. 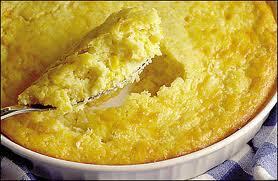 Try to do this over a dish that can catch any of the starchy white milk from the corn. Go back over the cobs and scrape out as much liquid as possible; you should have 2 cups of kernels and liquid. In a large skillet, melt the butter and sauté the kernels, their liquid and the scallions for 3 minutes. Add the flour and blend thoroughly. Stir in the milk, whisking to break up any lumps of flour. Season to taste and cook for 2 to 3 minutes. Remove the mixture from the heat and let cool 10 minutes. Meanwhile, lightly beat the egg yolks and mix well with cooled corn mixture. With a stand mixer and whisk attachment, beat egg whites until stiff peaks form and slightly dry. Gently but thoroughly fold in the beaten egg whites. Pour mixture in to prepared soufflé dish. Bake 20-25 minutes until puffed and golden. Remove from oven and serve immediately.